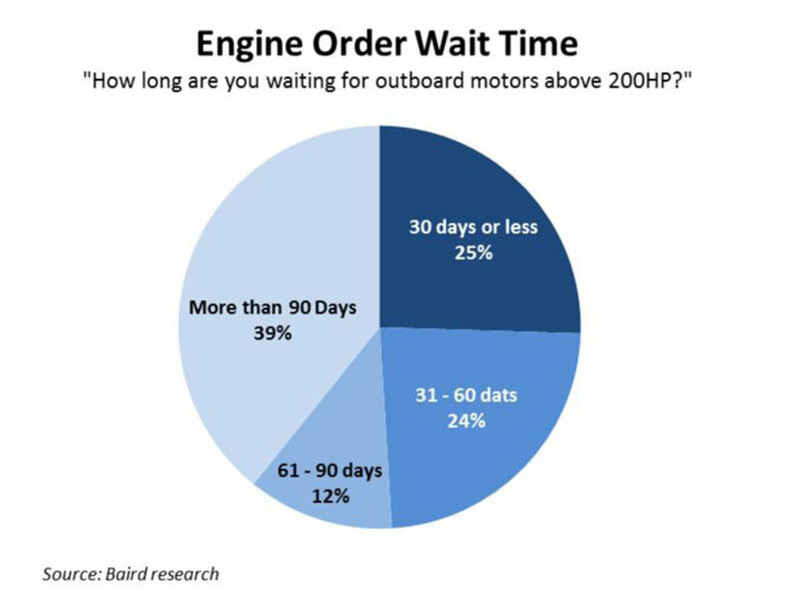 Three quarters of dealers responding to a new survey say they’re waiting at least a month for new outboards, and 40 percent say they’re waiting more than 90 days to get their orders filled. Only 25 percent of dealers said their wait time was a month or less. “Not having motors and props,” said one dealer who responded to a survey question about what is not working. Several dealers who responded to a survey conducted by Baird in conjunction with the Marine Retailers Association of the Americas and Soundings Trade Only say they are also having a hard time receiving new boat inventory, which negatively impacted sales. Generally, the measures were positive, according to Baird, with dealers being more optimistic about short-term and long-term conditions than in June. “While the industry backdrop is favorable, we expect company-specific events — spin-offs, acquisitions, new products — to be larger drivers of stock performance,” the report says. One respondent says the buzz on 2019 products has helped sales; tow boats, PWC, pontoons and Yamaha sportboats were also highlighted in comments from dealers weighing in on what was working. “Minn-Kota&apos;s new spot lock trolling motors are a selling like hot cakes,” said another.